Serviced space located easily at this I-394 area at Saint Louis Park close to the downtown area with lots of restaurants, cafés, and hotels nearby. Offices in this Parkdale Plaza building are located on the fifth floor and the site offers a restaurant, ample parking and safe building access. This fantastic business center is easily accessible for all, due to the excellent transportation networks present throughout the locality. Leased spaced situated at this suburban location within minutes’ to downtown and close to many nearby restaurants and shops on the Honeywell site. Hotel accommodation and a fitness centre are also nearby. These offices are fully furnished to a high standard and offer a range of services and support functions, making this a perfect business environment. 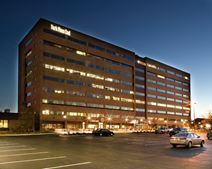 Located close to the International Airport and with easy access to Minneapolis, this Class A mixed-use office building houses this business center, above retail outlets on the ground floor. Executive suites and open-plan office space is complemented by meeting rooms, great facilities and an outside seating area. The area's local transport links are excellent and offer convenient and frequent services.